Glucagon, a peptide hormone secreted by the pancreas, raises blood glucose levels. Its effect is opposite that of insulin, which lowers blood glucose levels. 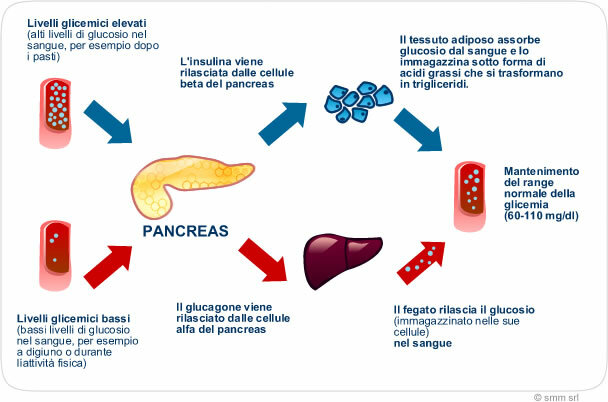 The pancreas releases glucagon when blood sugar (glucose) levels fall too low. The hormone is synthesized and secreted from alpha cells (α-cells) of the islets of Langerhans, which are located in the endocrine portion of the pancreas. Glucagon is a 29-amino acid polypeptide and it has a molecular weight of 3485 daltons. •	elevates the amount of glucose in the blood by promoting gluconeogenesis and glycogenolysis. Glucose is stored in the liver in the form of glycogen, which is a starch-like polymer chain made up of glucose molecules. Liver cells (hepatocytes) have glucagon receptors. When glucagon binds to the glucagon receptors, the liver cells convert the glycogen polymer into individual glucose molecules, and release them into the bloodstream, in a process known as glycogenolysis. As these stores become depleted, glucagon then encourages the liver and kidney to synthesize additional glucose by gluconeogenesis. Glucagon turns off glycolysis in the liver, causing glycolytic intermediates to be shuttled to gluconeogenesis. •	regulates the rate of glucose production through lipolysis. Glucagon has a minimal effect on lipolysis in humans.